When there's some tumultuous but promising news event that happens in a faraway land, it's easy to fix on the one cool famous person you know from there and hope that they'll come to power. (You see this happen in Senate primaries a lot -- remember Paul Hackett?) This can be a mistake, as perhaps there are lower-profile good folks who for complex reasons are actually much better suited to rule. Confession: I'm feeling that way regarding Egypt and Mohamed ElBaradei. How often does successful anti-authoritarian sentiment break out in a country and you have a Nobel Peace Prize winner on hand who has been staking out an anti-regime line? 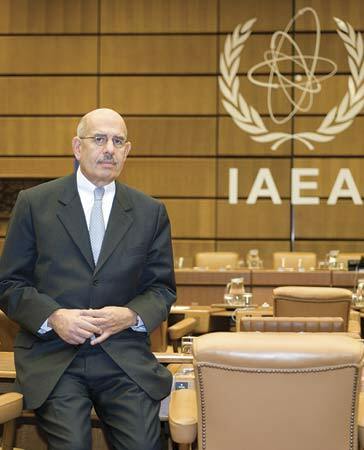 ElBaradei has spent his career trying to get the nations of the world onto the right side of one of the biggest issues facing humankind - nuclear nonproliferation. He called Bush on the WMDBS during the Iraq War and took a very firm line against attacks on Iran. The downside is that he's spent many of his years outside Egypt doing nuclear nonproliferation stuff rather than sticking it out in the country doing anti-regime stuff, which damages his cred among some Egyptians who've actually been suffering under the regime. So maybe there's some awesome revolutionary leader who's been Victor Laszloing his way around Egypt, always one step ahead of Mubarak's thugs as he stirs up pro-democracy activism, and who'd make a really good president or whatever they're going to call it after the revolution. That's the sort of person who gets regarded as most legitimate by the populace in these situations. But there's a lot of ways things can shake out. And maybe the strategic thinking will be that the best thing to do is to put ElBaradei at the top to secure international support, and the politics of revolution will allow that outcome. If so, cool!